5 Easy Ways to Freshen Your Home Up for Spring! Spring is in the air! Nothing excites us more than freshening up our homes with Spring decor. It is so easy to get your home in the Spring mood. 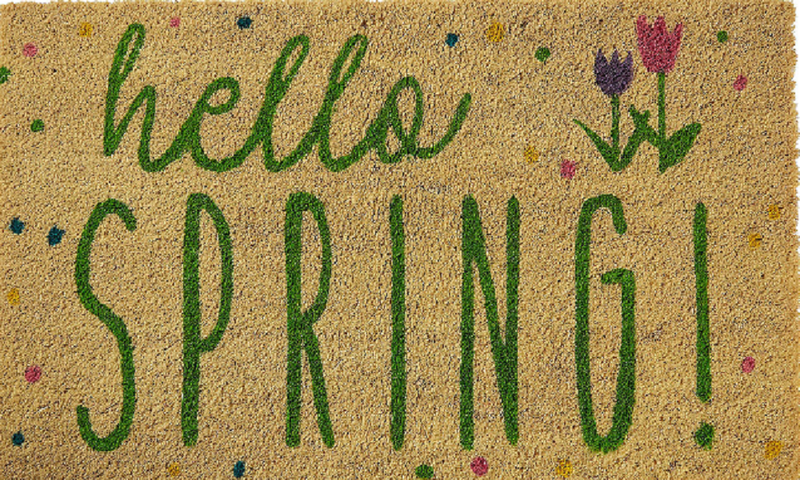 Here are 5 easy (and cheap) ways that you can add some Spring cheer into your home today! Freshen up your Powder Room. Swap out those dark winter-like towels for some fresh new ones! Think color, patterns, or even clean crisp white towels. Something as simple as a new hand towel will help make that space feel more spring like. Plants. If keeping real plants alive is not your strong suit, then we say fake it till you make it. Marshalls has a great selection of fake plants, succulents in particular. Add these cute little plants around your home and it will instantly lift your spirits. Update your candles. It’s time to retire the dark candles and holiday smells for fresh scents and floral hints. Doormats. Trade in your old doormat for a new one! They are so many cute designs, from the fun Hello phrase to a floral print, here is a great site with some of our favorites. The door mat photo shown above can be found at Party City! Swap out your kitchen table decor. Trade in your table runner for a new one. Polka dots, pastels, even a white or cream runner would look great. Now is also a great time to start setting our some of Easter decor. Adding pops of color and hints of Spring to your home is a sure way to lift your spirits and will help get us all thru the last of this winter chill!